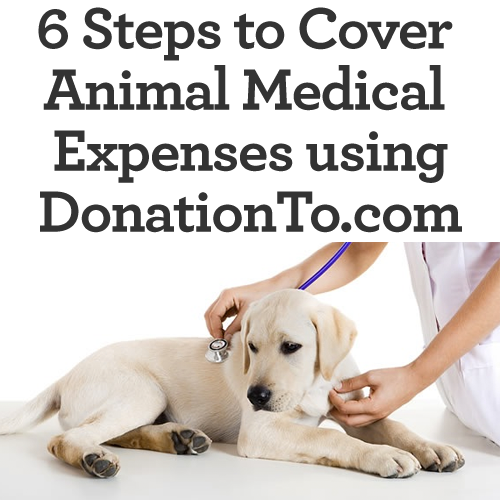 Animal medical care can be extremely expensive, and in today’s economy this can cause pet lovers a huge financial strain. Whether your pet has ongoing extensive medical needs, has been through a surgery that cost thousands of dollars or has passed away due to extensive medical issues, the cost of maintaining everything can often be unbearable. Rather than become so buried in debt that it is difficult to properly care for your pet’s needs, you should consider hosting an online fundraising campaign. Even if you are unable to handle the process yourself, you can recruit a friend or family member to help you raise money online. In the case of extraordinary expenses, you should keep the fundraiser going all year-long to gather the most support. If your beloved pet has passed away from their medical issues, then you should keep your online fundraising campaign up for a year as a memorial and a way to help cover all of the expenses that you incurred. Creating an online fundraising page is easy to do with DonationTo.com; it will make it much easier to raise money online, and your donors will also be able to leave supportive comments on the page that will provide you with some solace during a difficult time. The DonationTo.com platform allows you to upload photos that relate to your fundraising efforts, and posting a photo of your pet will encourage people to donate online. DonationTo.com has a powerful email platform that will enable you to reach out to everyone at one time, and utilizing it will achieve greater results than any other traditional fundraising ideas. You should make sure to explain what your fundraising page is all about in your first message and how people can use it to donate online. In order to use the email platform, simply gather all of the applicable email addresses and place them in a word document using the email address followed by a comma format such as amy@aol.com, sarah@yahoo.com, jason@gmail.com. From there, you can easily copy and paste the entire list into DonationTo.com’s email platform. A few days after your initial email, you should follow up by letting your potential donors know the amount that you need to raise for your pet’s medical needs. It unnecessary to have previous knowledge about how to fundraise in order to make your campaign a success; all you need is to clearly articulate what you need to cover the costs of medicine, surgeries and other applicable care so that your family, friends and other animal lovers will feel compelled to donate. Continue to communicate every few days so that donors are kept in the loop. Let them know how far away you are from your goal. You should also provide them with updates about how your pet is doing. During an emotional event it is okay to over communicate, and doing so will help people understand whether they need to provide more financial or emotional support. Even if your fundraiser falls short of your overall goal, it is vital to take the time to thank everyone who donated. Keep in mind that you may need to host a fundraiser again in the future, and you will want to maintain everyone’s support. Communicate with people about how grateful you are for their help, and consider asking them if they have any additional fundraising ideas to help you get to your goal. Even if you are unsure about how to fundraise, DonationTo.com‘s easy to use pages and email platform will help you host a successful fundraiser for your pet’s medical needs. Communicate with current and potential donors on a regular basis to keep them in the loop and to encourage additional donations. Always take the time to thank all of your donors, even if you end up falling short of your goal number. For animal crowdfunding our donation website has more useful tips. To know more about how to crowd fund for animal medical expenses sign up on DonationTo.com.